A wave of young people washed up on the shore of Lake Ontario this week – and they’re all looking for Pokémon. Since last weekend, the trails down by the water in my neighbourhood have been peppered by youngsters (and the not-so-young folk who just love the franchise). That is, of course, because of the Pokémon Go game that recently came out. I hear the kids are looking for Squirtles and other water-oriented Pokémon, which are thought to be most prevalent near water. In Canada–where summers are fleeting–it’s nice to see people enjoying being outside, even if they are glued to the game. I haven’t minded sidestepping them on the sidewalk, and it’s been funny to watch them run through the nearby college campus. All this brings back memories of my little brother, who had about five Pokémon Gameboy games as a kid, and would always watch the show when it was his turn with the remote. Weirdly, he has not been keen on the resurgence of Pokémon now… But never mind, I have enough nostalgia for the both of us. The trend has also repolarized Pokémon crochet patterns, which I have seen popping up on Reddit and other forums. A few years ago, there was a big Pokémon amigurumi trend, so there’s plenty of pattern options for people who want to create a baby Charmander – or my recent obsession, a Bulbasaur that you can grow a plant in. How cute is that?! I saw the pattern and now I can’t find it… Ugh. I was inspired to join in the craze by my friends at the podcast Geek Top Five. Check them out! This week there’s a great list of sought after Pokemon, and some details about the new game. I had a go at writing down the patterns, too! So, if you want to take a crack at them, or just get inspired to make your own, go nuts! So, what did you make this week? P.s. Last month I got married! It was a fabulous year of planning and prepping, but I’m looking forward to much more stitching now that I have more free time! 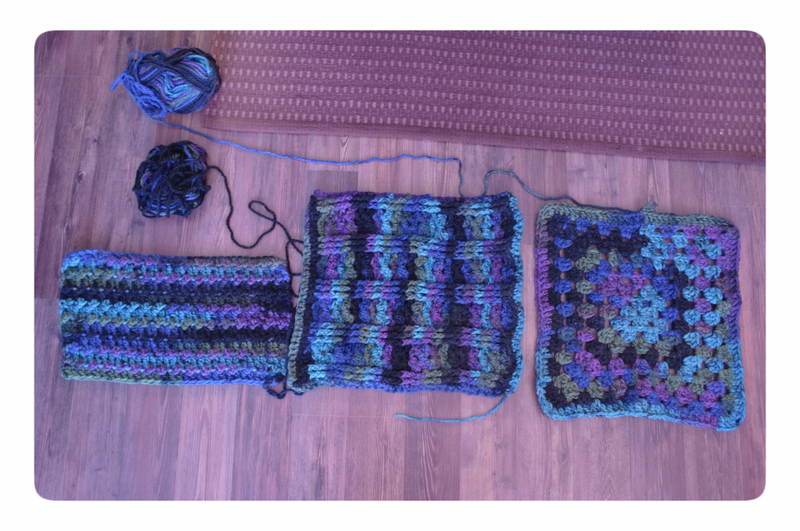 I’ve already got two other projects on the go… Can’t wait to share them with you! Rolling hills, glistening sea and even the smell of the air – there’s nowhere quite like New Zealand. And I am so lucky to have just received some very special yarn from that country. Two skeins of wool in the colour “misty grey” are now mine, sheered from the rare breed of Gotland sheep. But these strands didn’t come by the post. Some history: My father grew up in New Zealand and I still have family there. That includes my Nana, who first taught me how to knit and purl. When I was a girl — deeply committed to my ballet classes — I was always the envy of other girls with the coziest, snuggliest leg warmers at the barre, made for me by Nana. While crochet has become my first love since then, my Nana’s house in South Island of New Zealand was ground zero for my introduction to the fibre arts. So, when my Dad announced he was making a trip home to see the family this March, I was hoping he might bring me back some yarn. 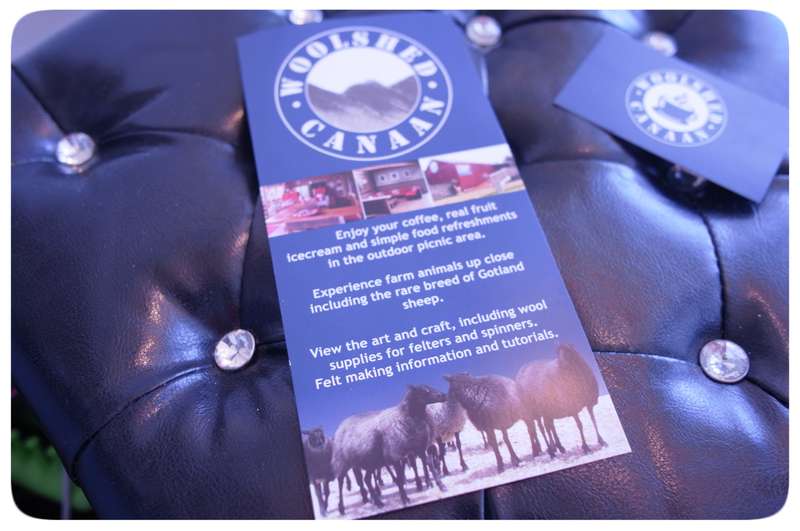 And he did – from a farm and craft shop called The Woolshed on Takaka Hill. 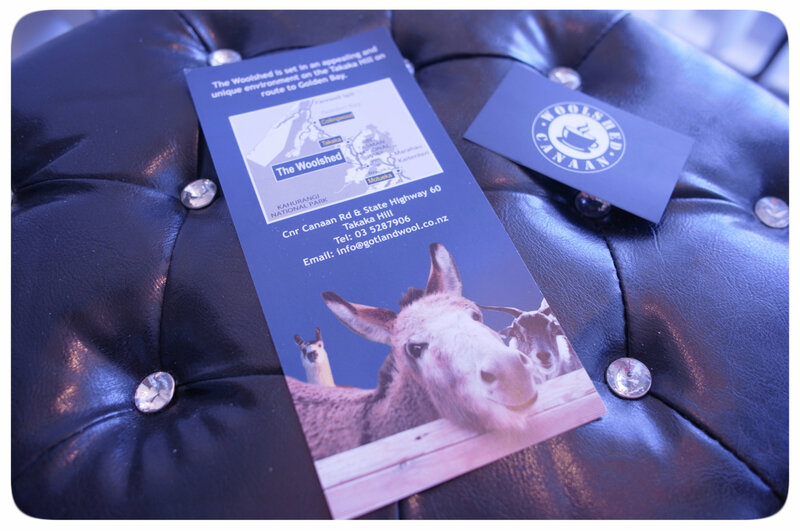 It’s pretty cute place by the looks of things, with a lunch menu, ice creams and farm animals you can pet! But this delivery was extra special to me because my dad also brought back my Nana’s knitting needles and the bag she used to put her yarn in. I am so lucky to have received it, and it’s found a home next to my glitzier yarn box. And that about sums me up – a taste for the modern and the vintage. Naturally I can’t wait to see what I can do with this yarn… but I’m also inclined so save it and just enjoy the possibilities for a little while. It’s Work In Progress (WIP) Weekend! I usually prefer to blog when I finish objects that I’m proud of, but lately I’ve been starting a lot of new pieces and haven’t wrapped up many (…any) in a few weeks. And it’s getting kinda lonely over here without any posts. So, here’s a little update about what I’ve been up to. 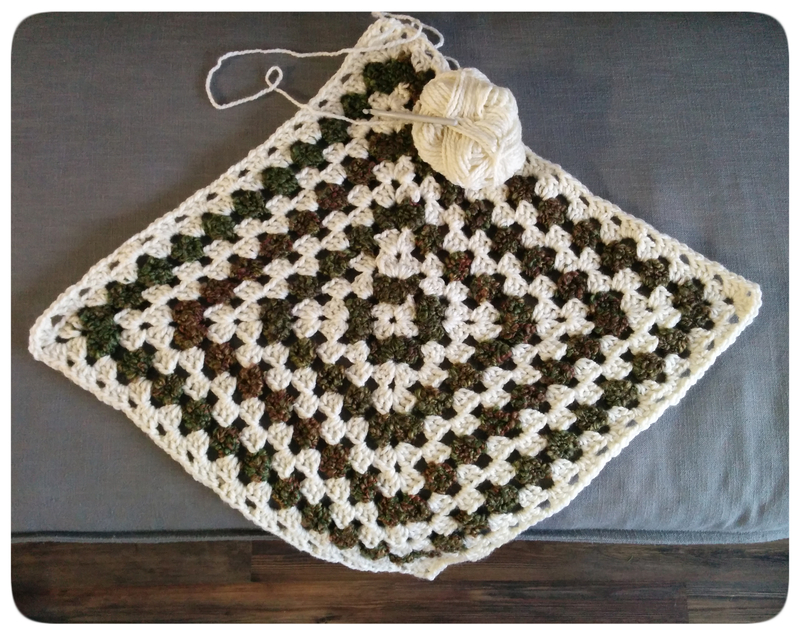 This is a simple chevron blanket that I’m doing up for a baby that’s due to be born in June. I am so excited for that little muffin’s arrival! He’s going to be a water baby (to be born in Newfoundland, near the ocean), so I decided to go with a water theme. 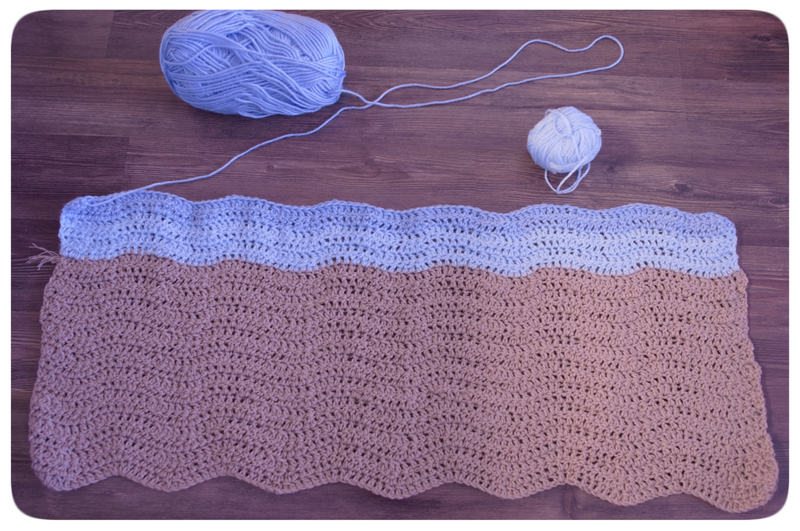 I’m making up the colours, but if you want to know how to make a ripple, DaisyCottage has a good pattern here for your waves. There’s a sandy beach and I’ve started on the water. You could add all kinds of sea creatures, and a crab on the beach! Possibilities are endless! I haven’t decided if I’m going to do fish or sailboat appliques when I’m done… Thoughts? 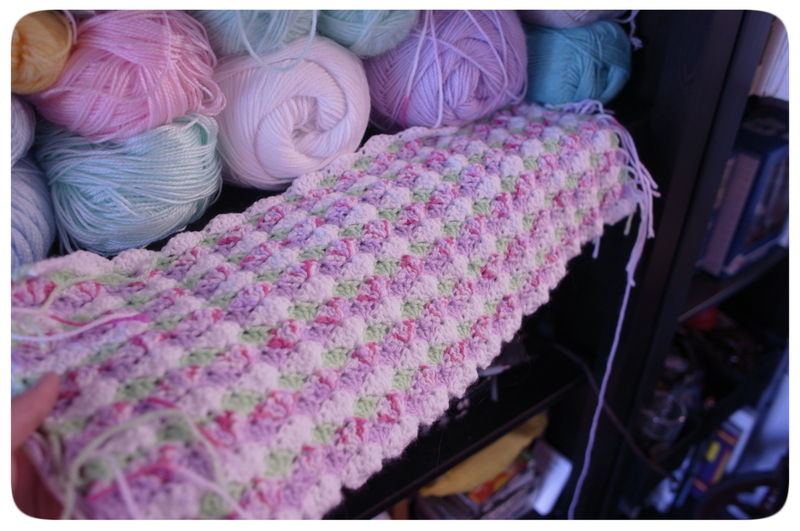 And here’s a baby blanket I started with the yarn leftover from the Langley blanket. 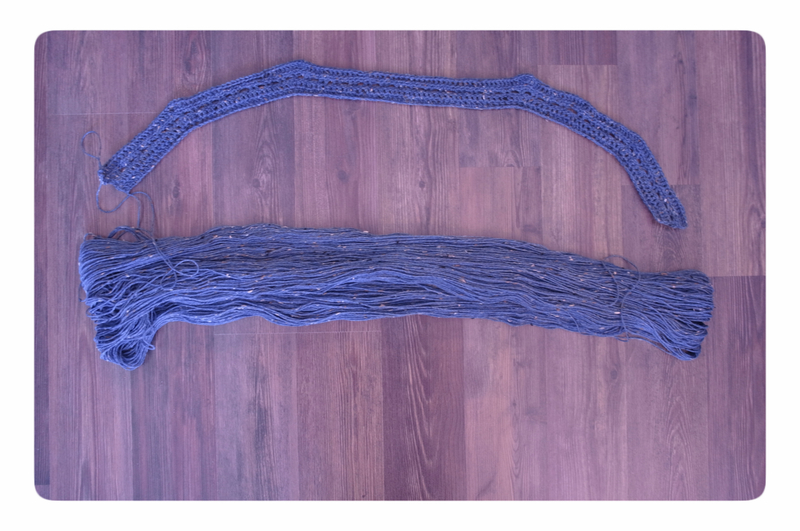 It’s the crochet beachcomber blanket by knitculture, but I’m using a lighter weight yarn and went down a hook size. Crochet shellz 4 dayz. And I think that’s the major stuff, for now. What are the rest of you working on? This winter has been all about hats. An ear-flap hat as my first commission ever. 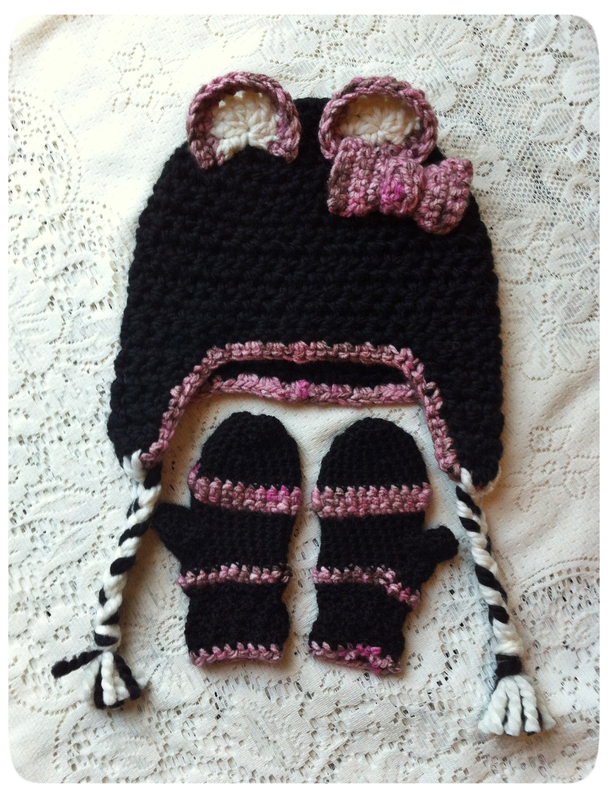 Another bear earflap hat and mittens when the first one turned out to be too small for the toddler. (I was gutted!) 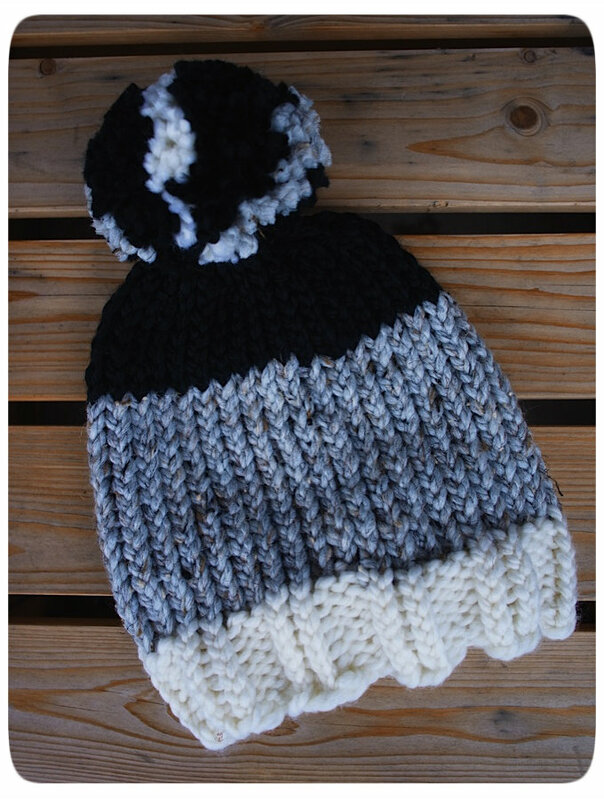 A hat for my Secret Santa to keep her cozy as she walks her English bulldog. A hat for an old friend. Dozens of hats with massive pompoms falling off my loom like snowflakes from the clouds. There’s no sweeter project when you’re camped in front of the TV watching White Christmas for the millionth-and-a-half time. And since I kept seeing those massive pom-poms all over town in the last couple of months, I figured this was the year for cranial snuggles. And you know what? It’s nice to do a few projects that aren’t a labour to create, and yet still manage to be crowd-pleasers. I’m sure a lot of you think this is cheating, but I love the knifty knitter loom. Here’s the way to create perfect hats every time. -Begin decreasing by taking the loop of every fourth peg and putting it on the peg to the right. Knit off all these moved stitches. Then e-wrap all the remaining pegs (this would be three pegs in a row, then a space). 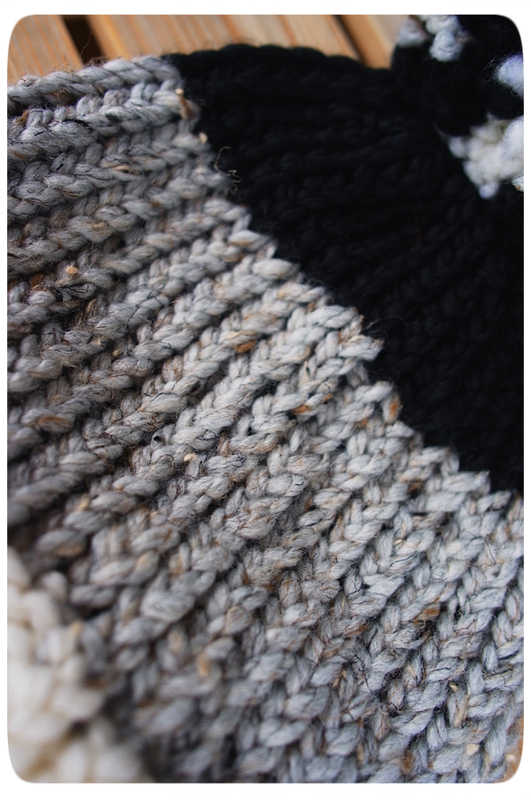 -Continue decreasing by taking the middle stitch of every remaining block of three stitches and moving it to the right. Knit off these stitches. E-wrap all the remaining pegs (this would be every other peg on the loom). 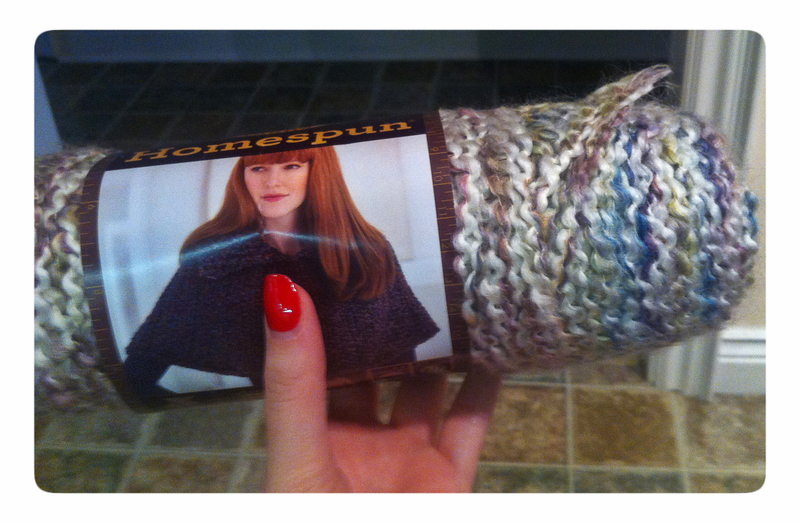 -Take your working yarn and wrap it around the whole loom. Cut it, leaving a long tail. Then use the working yarn and pull it through each stitch. 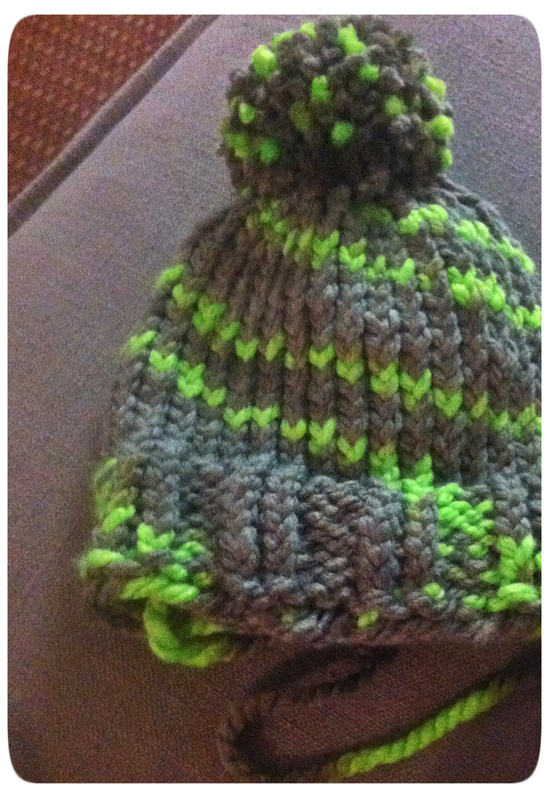 Using you knitting tool take all the stitches off the pegs and pull the yarn to close the top of the hat. -Tie it off on the inside of the hat. So, what have you been working on this week? 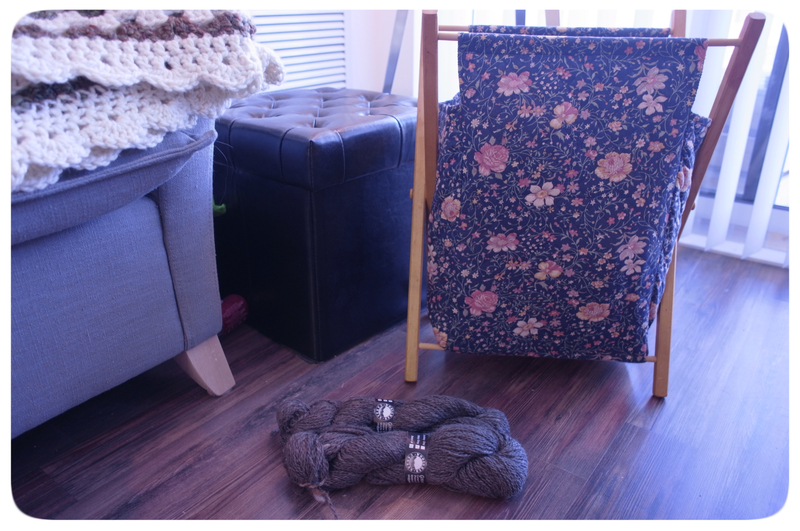 Recovering from Holiday Yarn Hangover — Ready for New Projects! Sunday morning and the wine is already open… to add to a Sunday roast in the slow cooker, of course! The Christmas décor might have to go back in its box today, but nothing can stop me from soaking in the last of the holiday before kicking off the New Year with a hiss-boom-pow on Monday. 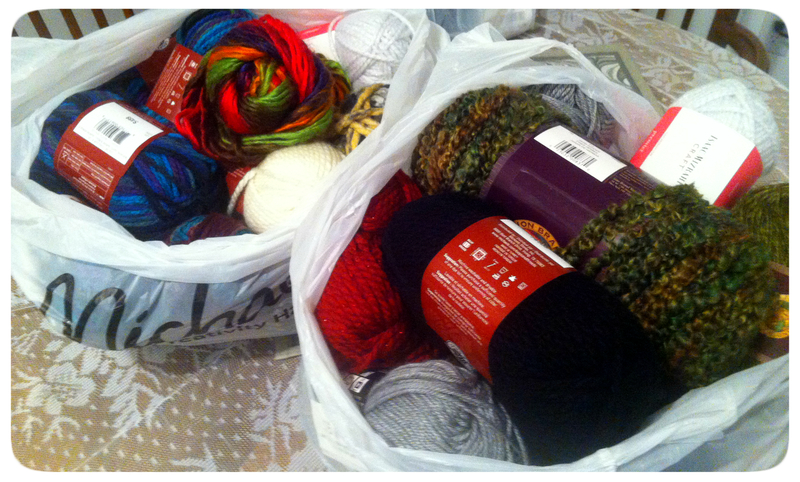 The lead-up to the festive season was a whirlwind of… mostly just yarn. Fibrous fluffs abound! I didn’t quite meet my goal of crocheting ALL my gifts this year, but I did knock out a bunch of projects I was really proud of, including an embellished tea cozy for my mom (which I sort of made up), Martina Gardner’s Sir Knight Helmet, several of Knotted by Nicole’s Mindless Scarves in different yarn weights. I didn’t avoid staying up until 3 a.m. on Christmas eve (boyfriend snoozing beside me) madly weaving in ends and desperately knotting ends. Zzzzzzz… That’s probably why I completely missed getting photos of a lot of my work. Lesson learned. But for all my efforts, I got pretty lucky this Christmas. I received the Boye crochet master set (get ready, lace, I’m comin’ for you!) and plenty of yarn. My man’s grandmother also gifted me her set of Boye knitting needles now that she’s unable to stich any longer. My first effort to make use of them isn’t exactly worthy of posting, I know. But I’m keeping myself humble here. Anyway, there’s never going to be a shortage of projects ever again! 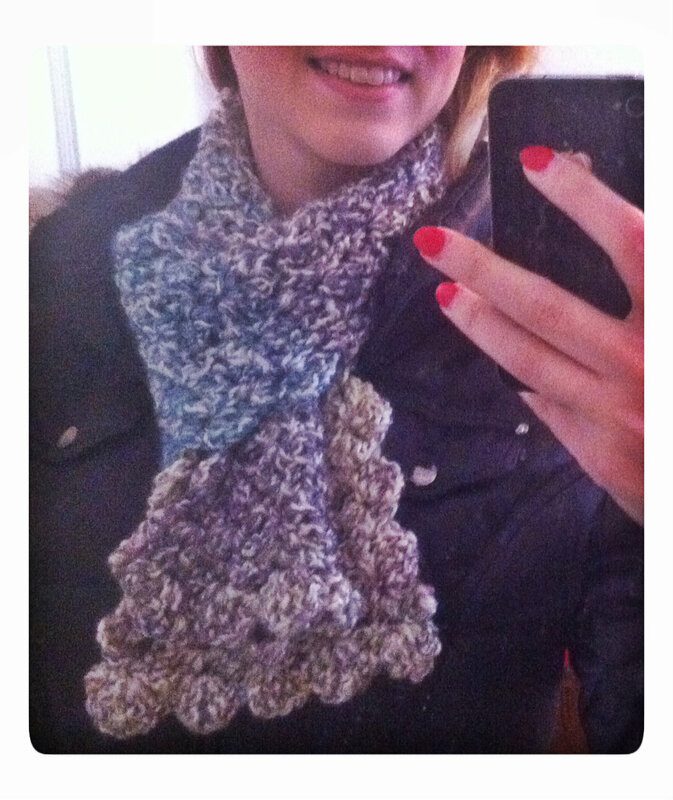 In the annual Reddit Secret Santa gift exchange I received some Lion Brand Homespun yarn from a gifter who was concerned I might not be able to turn it into anything, so I worked that up into a scarf too to show her. Now that the holidays are over, I’ve got high expectations for all the work to come this year. I’m on to baby blankets and clothes for a few newborns expected in 2015. Can’t wait to swaddle these little munchkins in something cozy. But first, I’m making myself a simple granny blanket, because It’s been ages since I made something just for me, and it’s snuggle time. I’m thinking of taking a couple of Craftsy classes to improve my skills, too. So, what did you guys make/receive this holiday? It’s *that* time in the afternoon when my little fingers start itching to dig into my yarn pile! I hope to get through all of this–and a bit more–before Christmas time… am I crazy? ?